Probably, you just saw your dog get frightened and run when he heard that loud sound of lightning, thunderstorm or fireworks. You then wondered why are dogs afraid of thunder and why he had to escape to a place he can hide. For your relief, dog scared of thunder is a common behavior in dogs. Dogs generally develop a fear for loud sounds. Vets call it storm phobia. Your dog may have never had a traumatizing experience with thunder but you will discover this fear in him. The escape to a different place where there is less noise is a way of reducing the fear. Many people owning dogs are yet to understand what results to this behavior. It is important you try resolving this behavior since it may develop further and worsen if nothing is done. Over time, if not resolved, your dog is likely to become afraid of every other thing that is associated with thunder, fireworks or any other loud sounds. Dog afraid of thunder, lightning or fireworks is common in dogs. The most common behaviors associated with your dog’s fear of thunder include restlessness, destructiveness, hiding in small places, barking, whining, sitting or leaning close by the owner, trembling, pacing, panting, drooling dilated pupils, defecating, urinating and trying to escape by running away. This behavior or signs will not be the same for all dogs but may vary from one dog to the other. So how can your dog handle thunderstorm phobia? Here are couple of things you can try to make your dog calmer during loud thunder. The fearful behavior in dogs does progress if not handled early enough. Every time thunder strikes it may result to more fear in your dog. Take action as soon as this behavior starts building up. This means you need to be available at that time when there is thunder. Leaving your dog alone will cause her to be more fearful. Identify the place your dog escapes to when he is running away from the loud sound of thunder. This could be under the table, in the basement of your house, under your bed or even in the bathroom. 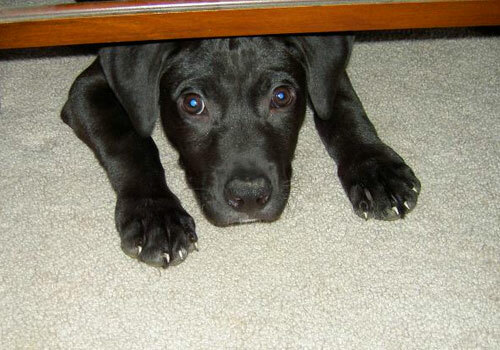 Remember hiding is one of the ways dog defend themselves. Create and allow that specific place freely accessible by your dog. Your dog will be free from any harm or injury whenever he will try to escape. There are dogs that like hiding in crates. If yours is one of them, then move the crate to a place that is safe. 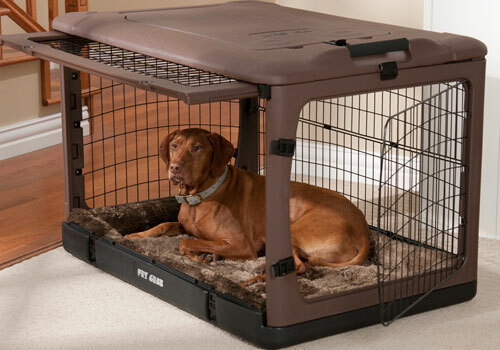 If you move the crate in your house then the door should be left open to make it easy for your dog to walk in and out freely. Another possible way is by creating a place within your house that can shield your dog from the loud sound. Let your dog hide in this place any time there is thunder. Of course, you will have to train and encourage her to get used to that place by feeding and giving her toys to play with from there. Not all dogs will give in to this method of hiding since there are dogs that don’t escape into hiding when frightened. You should be on the watch to notice when your dog is beginning to develop anxiety and fear. As soon as you see the signs of fear, engage her into something that excites her like playing with a toy. This will divert your dog’s attention into doing what you are engaging her into. Although it might not be possible for you to continue keeping her attention on the game when the thunder starts, you would have delayed the fear. 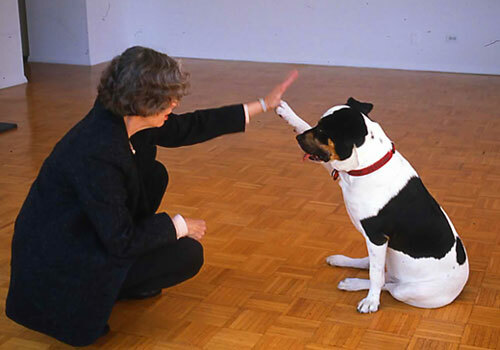 However, you should not continue doing this when the dog isn’t giving in to your attention change since it will worsen the behavior. Consoling a fearful dog only encourages its fearful behavior to get worse. You should not, therefore, reward your dog when it expresses such a behavior. Train and encourage your dog to always follow your commands. This is one way by which you can successfully do away with the fears in your dog. 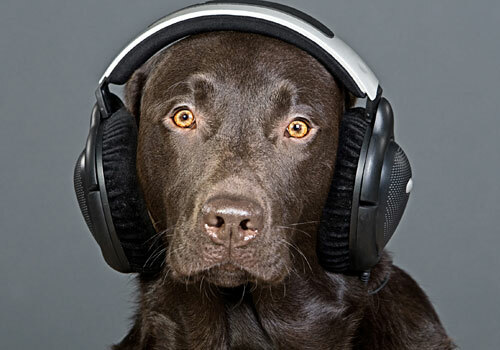 It involves playing a CD of thunder sound recordings to your dog in the absence of any noise. Start with a reduced volume so as your dog won’t be frightened. As time goes by, gradually increase the volume as you watch for any signs of fear and anxiety. If she expresses any fear while the CD is on stop it and then start the next session at a volume that is comfortable for her. You can reward your dog with treats or something that she enjoys while doing this. Do this repeatedly over time until your dog does not respond fearfully to the highest volume. This will help your dog learn to respond to thunder without fear and anxiety. For desensitization to be successful, it should be done in the season when there is no thunder so that the dog will not encounter the actual sound. However, this process might also not work for all dogs. Anxious dogs may find comfort when they have attires such as the anxiety wrap, thunder shirt, and the storm defender cape. However, this may not work with all dogs with fearful behavior. There are herbal products that can induce calmness in your fearful dog. It is not an easy task finding these products. Determining how effective they can be is also another challenge with these herbal products. You can try a number of such products to see if they can help with your dog. It is important you discuss such products with your vet so that he can advise on any possible risks to your dog’s health. Exercise is one of the ways of stimulating your dog. Give your dog a vigorous exercise on the day when thunder is likely to occur. 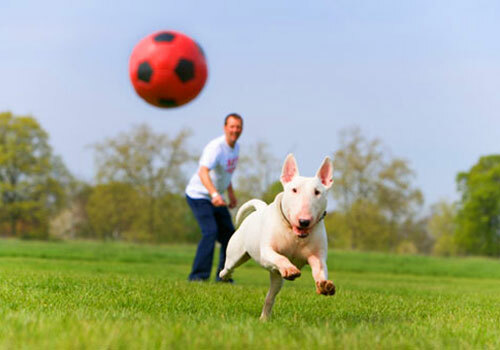 This makes your dog expend a lot of energy as well as getting physically and mentally tired. Your dog will have less energy to respond to the sound of thunder. Exercise helps relieve your dog from any stress, fear, and anxiety. Like humans, dogs are social beings and they are able to be affected by their surroundings. 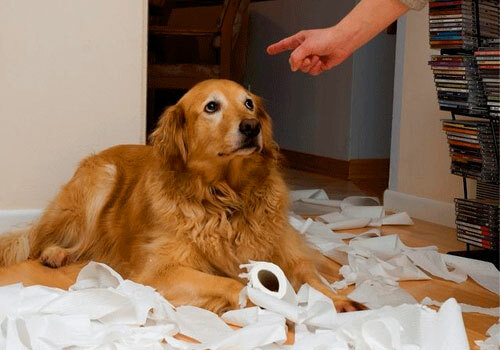 It is, therefore, important for you as a dog owner to have a calm attitude towards your dog. Expressing any fear or nervousness can result to increased fear in your dog. Dogs are always aware of their owner’s attitude and state of mind. If your dog has health problems, it may experience increased stress levels. Increased stress in your dog will lead to anxiety among other conditions. It is important to feed your dog with a balanced diet to free him from any behavioral changes that may develop as a result. Your vet can give you advice on what diet is good for your breed. 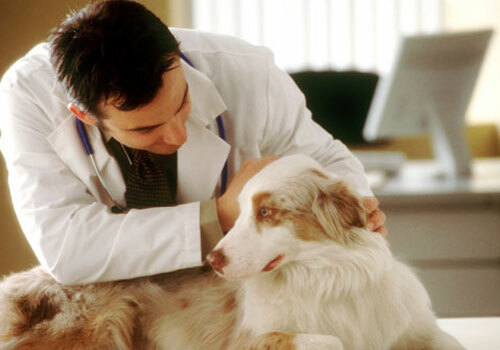 Medication can be used to relieve the anxiety and fear in your dog. Actually, it is one of the best methods you can use for your dog. This is the reason why you should consult with your vet for him to examine your dog. He will then prescribe the most appropriate medication for your dog. There are medications that you can give to your dog just before thunder occurs i.e. when expecting it while there are others that are you may be required to give throughout the period or season. The mistake you can make is giving your dog medication that has not been prescribed by your vet. This can adversely affect the health of your dog. Dogs form a deep emotional bond with their owners and their owner’s reactions make deep impect on dog’s hehavior. Dog owners should not react in a way that is alarming to the dog. Here are couple of thing that should be avoided by dog owners. You should not give her any attention when she is behaving fearfully. This includes both positive and negative attention. When you shout at your dog when she is afraid it will seem like a reward for her behavior. She will keep doing this to get your attention. The best solution is ignoring and acting as if you are not noticing her fearful behavior. Punishing your dog will not help your dog stop being afraid of thunder. It will instead your dog’s behavior worse. This can also result in injury to your dog which will affect her health. Dogs get frightened and escape into hiding when there is thunder. When you force your dog to experience thunder, then you are not helping but making her become more fearful. Watch this video for few more handful tips. 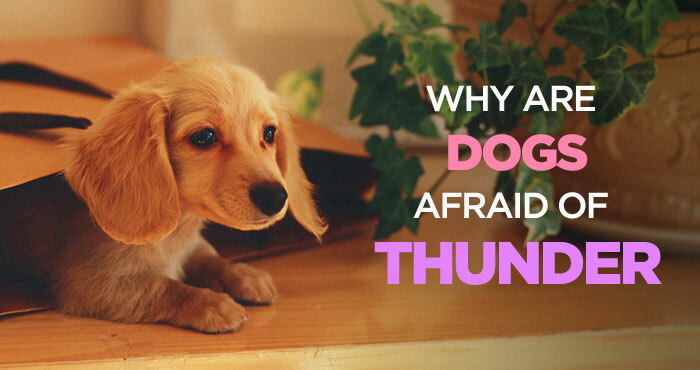 The fear of thunder in dogs is common. However, this behavior should be handled early so that it doesn’t get worse. You should consider consulting a veterinary behaviorist who after examining your dog can prescribe the right medication for your dog or advice you accordingly. This is the best thing you can give to your dog. You will be keeping her away from the suffering brought by anxiety. Trying to give your dog your own medication without the consent of your veterinarian is putting her at risk. This might result in long-term health problems. Why Do Dogs Chase Their Tails: Is It a Sign of Mental Illness? You don’t know anything. Dogs are afraid of storm because they can see the matter what all mighty Allah’s ordered. Understand? I’m sorry, but were you dropped on your head as an infant, or were you just born stupid?